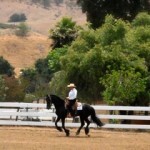 Carol Tice, Rocking T Ranch, has been riding dressage since the early 1980’s. While showing Western Pleasure horses, she knew there was a better way to ride the horses the way the judges wanted and started with dressage. She never looked back and traded her western saddle for a dressage saddle. During the next 30+ years, classical dressage was always involved in her showing horses in jumping, trail, western riding and dressage. All of the students at her riding school worked and showed using dressage principles, no matter what saddle they choose to use during their ride. Carol offers lessons, on your horse or hers, for riders just starting into the sport or returning after a short or long break from the sport. Lessons are offered to riders starting at the age of 3 and for adults of any age. Carol is also available for clinics and specializes in clinics that introduce Western Dressage to riders of other disciplines.